Davis Mega Farm Festival has long been a favorite of mine. Taking place over two months, it’s more of a mid-level attraction and theme park, but the outdoor celebration is certainly festival-like, good for families with kids, but also for teens and young adults without kids. 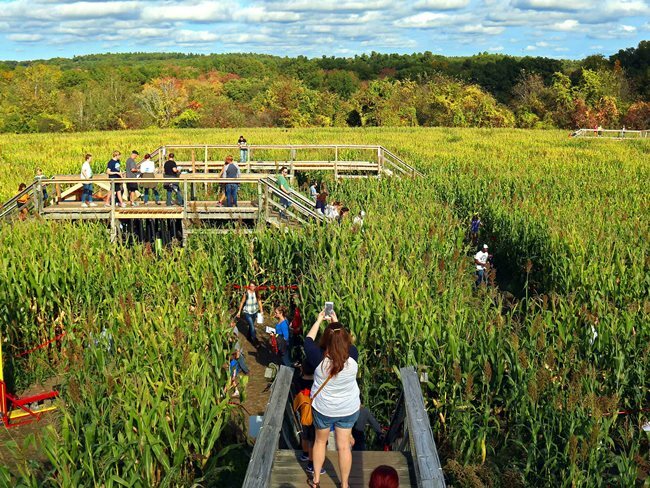 Previously called Davis Mega Maze, it features New England’s best corn maze on a large farm near Worcester. And across the street, Davis Farmland is a kids’ farm adventure. 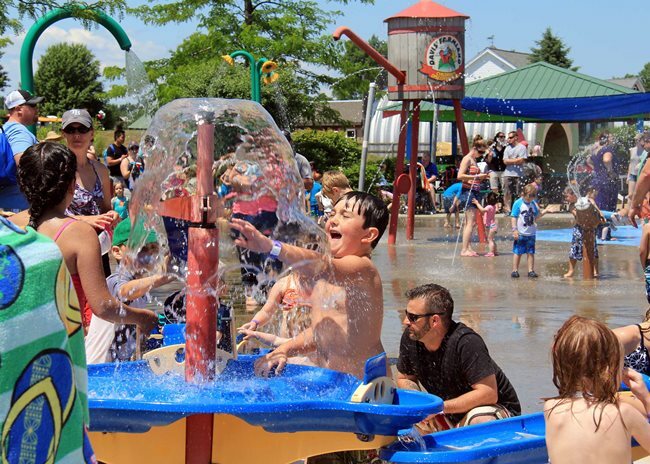 Previously, I’d describe Davis Farmland as mid-level, larger than a fun park but smaller than theme parks such as Canobie Lake Park where you can spend an entire day, but they keep growing and growing. You really could spend an entire day at Davis Mega Farm Festival now. On one side of their farm, Davis Mega Farm Festival is a giant outdoor courtyard of farm-themed games, music, and food. It’s great for kids, but you don’t need kids to come, and all of their attractions are themed for teens and adults as well. 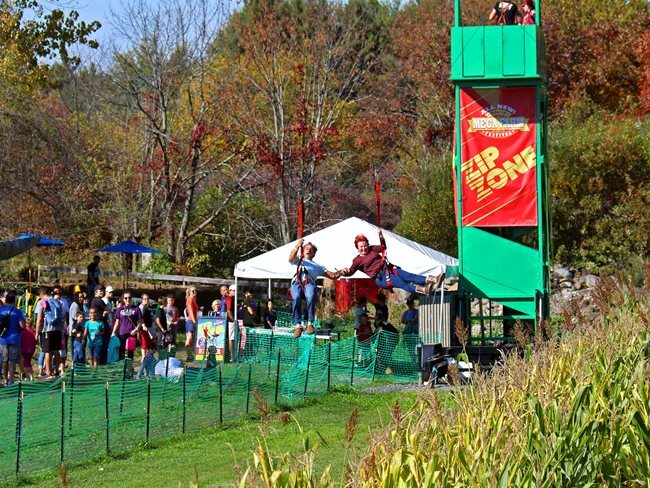 You’ll find more than 50 attractions including a short zipline, a giant inflatable pad for bouncing around, an archery center, an inflatable side and bouncy house, petting farm, and more. There’s a petting zoo, and you can climb into a foot-powered pedal cart to drive around. Or climb into a giant inflatable ball for “Knocker Soccer”, where you can chest bump your friends without consequence. 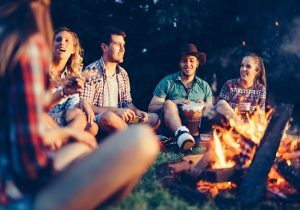 Among all these attractions, there’s a live music stage with a rotating schedule of performers, and in the evening you can sit by a campfire. (Campfires are also available for exclusive rental for private parties.) Out back you’ll find a paintball range, where you can shoot at somewhat ordinary looking hanging pans, bottles, and metal targets. There’s a tug of war pit. There’s so much to explore, and it’s all farm-themed and natural seeming. You won’t feel the commercialism of a traveling carnival, but they also don’t have big rides such as a Ferris wheel. Events INSIDER lists more corn mazes than anyone else in New England, and as an expert I can certify that the Davis MegaMaze is the best. 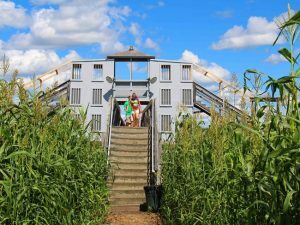 As part of Davis Mega Farm Festival, it’s an 8-acre corn maze with bridges that make you walk up and over the corn field, which makes a three-dimensional topology — it makes the maze more interesting and harder to solve. This year the Mega Maze was planted in the shape of as an advertisement rather than fun past themes of dinosaurs, archaeology, aliens, and pirates, but you can’t tell that from ground level. By opening weekend the corn had grown surprisingly tall, perhaps 10 feet high, making me wonder why they didn’t open earlier in the season. It’s great fun to walk the maze and explore, getting lost and finding your way back. Unlike other corn mazes, the Mega Maze is dotted with signs with riddles, and clearings that have games. You’ll even find a snack shack in the maze! So there’s plenty to do as you wander, and the unique clearings help you remember where you’ve been. Also unlike other corn mazes, where your view is continually hidden by the corn, walking over the bridges at the Mega Maze lets you see everything, a good visual break. Pro tip: don’t try too hard to solve the maze. It’s very challenging to make a map, or use a map, to figure out where you are. Just keep walking and try not to backtrack, orienting yourself with the music being played and what little you can see over the corn stalks. Another pro tip: it wouldn’t make sense to place interesting maze features such as games and bridges, where nobody can find them, so always turn towards them when you have a choice. This year’s maze only took us 26 minutes. I don’t think we’re that good, just lucky, or perhaps the maze with its large logo isn’t as nefarious this year. You can always go back inside and follow one of the “challenge levels” for more adventure there. If you or your small child get tired of walking the maze, ask friendly staff for a hint to get you out. Note: if it’s rained recently, wear boots. Thankfully, the paths are wide enough for oncoming groups to pass each other easily, but leaves of corn do stick out into the path in many places. When you emerge, get a beer from The Wachusett Brewing Company, and find a wide variety of foods including ribs, a pulled pork sandwiches, BBQ jackfruit sandwiches, chipotle BBQ sausages, corn bread with apple butter, and tomato salads. Davis Mega Farm Festival is far from a kids-only attraction, but if you bring kids, it’s delightful to watch them jump around while you’re sitting, relaxed, with a beer. Staff come around and welcome you, proactively helping you navigate the space and know what there is to do. Then we walked across the street with a friend and her kids. They sell pumpkins, and you can go apple picking and pumpkin picking. I assume there is a farm store, though we didn’t see it. You can only enter Davis Farmland with kids, and they give you numbered wristband, checking as you leave that you’re with the kids you came with. It’s a safe, enclosed place to let your kids run around. 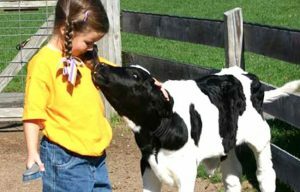 Davis Farmland is a family-friend farm that will delight children but not bore their parents. The major feature at Davis Farmland is petting animals. They claim it’s North America’s largest sanctuary of endangered farm animal, with rare breeds of goats, sheep, camels, chickens, ponies, donkeys, cows, emu, and more. Some animals, including sheep and a turtle, you get to play with, sitting in a chair with a brush to brush their hair and generally hugging them in pure delight. If you go at the right time of year you’ll find baby animals too. We hugged a sheep that was just 13 days old! It is the cutest! The campus is extensive, including a gem mining sluice, reptile ranch, pony rides, moon bounce, and a water spray playground. In Adventureland, find a giant slide, pedal-driven go carts, and other kids’ playground activities. My favorite is the hay ride, a 15-minute journey where you sit on hay bales and get towed out to meet yet more animals. Pro tip: sit facing to the left to see more, and choose a bay of hay whose strings are tightly wrapped, so it won’t come apart underneath you. Our teenaged host, even with a microphone, needed more pizzazz in his jokes, but we had a good time. An endangered bull even came up to our cart to eat some hay! You’ll find plenty of hand sanitizer and hand washing stations, and the Herd Rock Cafe to eat lunch. As well as the usual hamburgers, you’ll also find healthy snacks including melon cups, hummus and pita, veggies and dip, yogurt parfait, and berries and yogurt. 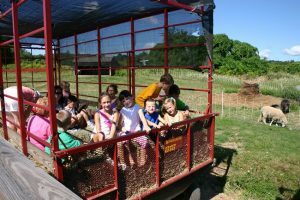 Davis Farmland (for kids) and Davis Mega Farm Festival (for everyone) are the perfect balance of accessible, but not too corporate, with plenty of creative and interactive attractions. I have an MBA and love to analyze the underlying business principles of a theme park: the marketing, the organization, the signage, and whether it really works for guests. 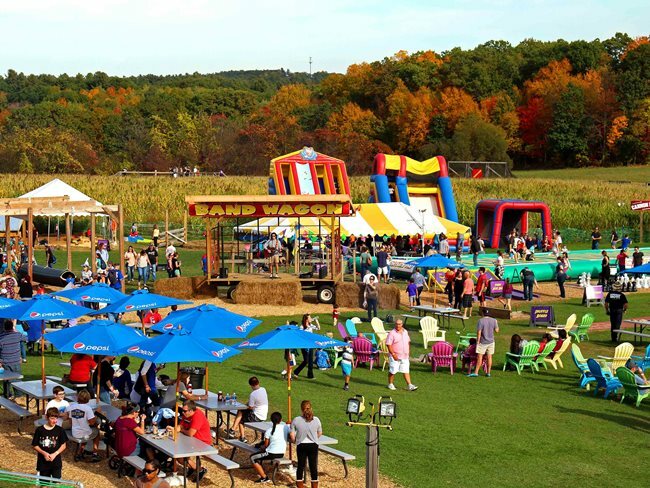 While Davis Farmland and Mega Farm Festival don’t have the scale of Six Flags New England, it makes my Top 25 List in New England because of its clever management, with its attention to detail, which makes it so easy and delightful to visit. Davis Mega Farm Festival, Davis Farmland, and their apple picking again deserve my rare 5 stars PLUS, making them a must-see. Both attractions are open through October. See davismegafarmfestival.com and davisfarmland.com.